Monday already. Where did my weekend go?! Couldn't resist using the lyrics from one of my favourite songs ever (Friday I'm in Love - The Cure) to suit a card of mine I should have probably shared ages ago! Now Gallery Idol 2012 has been and gone, (HUGE congrats to the well deserved winner, Joscelyne Cutchens and a big shout out to my fellow UK peeps, Aga and Taheerah who made the Top 10!) and after making the final last year, I figured I'd enter again with this card. It's a punny take on the very popular Pantone trend. Needless to say, I didn't make it past the open auditions round this time around. I was very happy to see 20 very talented ladies shine with their creativity and have myself cheer from the sidelines instead. In fact, half of me is glad I never made it further as memories of the stress and pressure of last year's competition came flooding back to me - LOL! How many more weeks until your summer starts? I love how you created a paint chip with this...so clever! I'm so into your card!! Love it!!! I love that song also! Thanks for sharing your card...love the simplicity! Brilliant card Aimes, just the sort of uplifting sky we had this morning but it soon disappeared!! and love me a bit of Robert Smith too. I remember seeing this in the gallery and thought it was so, so clever! I absolutely love it. And thanks for sharing your memories of Toronto! Be sure to let me know the next time you are here so we can get together. I'd love to meet you! great card-I have mugs like this but minus the pun! I absolutely love this! 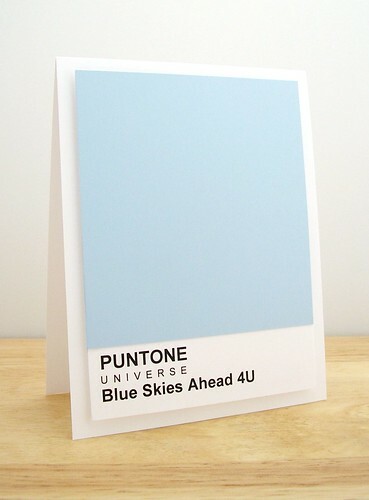 Any thoughts for a Puntone series? I always enjoy reading names of paints – even if I might not like the color, the name is often interesting! I Love this! Who wouldn't be cheered up by a good pun! I'm staring at my Pantone Books as I type this. This card is unbelievably so cute and fun. The message is perfect!